Senbowe is always being committed to providing a more healthy and more active life concept,lifestyle for our valued consumers,we try to introduce more bright mint green lids to enrich our house environment,which not only makes you enjoy inner peace but also helps alleviate visual fatigue especially in the fast peace of modern life. What'more,these food storage containers will be much more noticeable and attractive than any other similar containers in the market and help organize your kitchen orderly!! For the better using performance,we upgrade the lid-lock mechanism, once the ring on the lids is pushed down,the silicone seal inside the lid will expand to seal the jar,creating complete airtightness to prevent the dust and insects from entering,and providing the maximum freshness and prolonged food storage. 1.Simply remove the silicone attached along the lids of every container and wash with soap and rinse with water,warp the silicone around the lid again and seal to use again. 2.To clean the air-lock thoroughly,please remove the ring of the lids and you will noticed the lids are splited up to some parts(screw,upper and lower covers,the ring),please use the water to clean them one by one to achieve a quick dry. 【Premium Quality】: 100% brand new,made with high quality durable food grade & BPA-free materials to strict FDA guidelines. Toxin-free,no pungent smell, freezer Safe. Designed to resist stains and odors and withstand everyday use. With the clear transparent container design,you can easily see what inside in the containers just at a glance for a better storage management. 【Versatile + Multi Use】: Store your favorite foods safely into these efficient containers. Different size canisters allow for a variety of storage option. With 4 different sizes for edibles of all shapes, sizes, and volumes, you won't have to worry about jamming your edibles into containers. Includes 2 Tall Container(1.7 qt/1.9 liters), 1 Medium Container (1.1 qt./ 1.2 liters), 2 Small Containers (0.7qt/ 0.8 liter), 1 Mini Container (0.5qt/ 0.5 liter). 【Upgrade Mint Green Lids】: For the better using performance for the buyer, we have upgraded to the bright mint green lids, which is much more attractive and noticeable than any other similar food storage containers in the market. what's more,it can match your home style better and help organize your kitchen orderly!!! 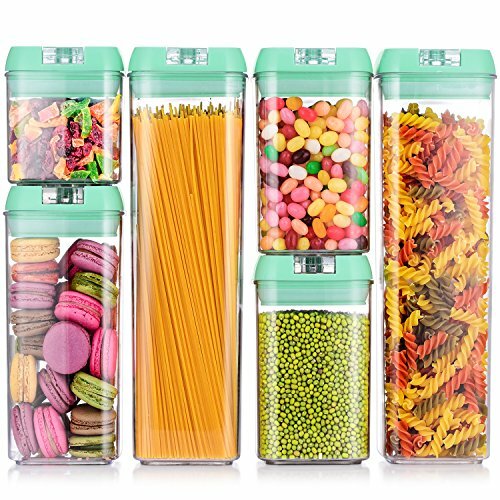 【STACKABLE LID DESIGN】 : With a stackable and modular design, these containers will save you a ton of space in your pantry and cabinets for better kitchen organization. Not only are these good for dry foods, but our containers are great for holding liquids such as water, juice, soup, and more. Container corners allow for easy pouring. Don't worry about spills as the senbowe food storage containers are designed to seal all liquids with airtight technology. 【LID-LOCK MECHANISM】 : Once the ring on the lid is pushed down, the silicone seal inside the lid will expand to seal the jar, creating complete airtightness. Pop the ring back up and it serves as a handle to lift the lid. Provides maximum freshness and prolonged food storage.